Pete Rose had his No. 14 retired by the Reds on Sunday in a ceremony that had to be approved by Major League Baseball because of his lifetime ban for gambling. 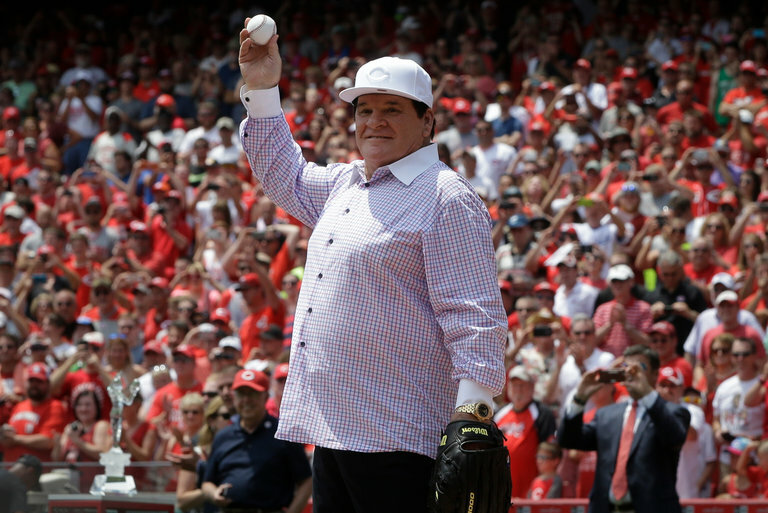 The Cincinnati Reds formally retired Pete Rose’s No. 14 on Sunday, capping three days of celebrations that filled Great American Ball Park and transported a struggling franchise back to its glory days, if only briefly. The Reds added Rose’s number to those displayed behind home plate — the 10th number to be retired by baseball’s first professional team — before beating San Diego, 3-0. Major League Baseball had to approve the ceremony because of Rose’s lifetime ban for betting on his team. “It solidifies what I’ve been saying for many, many, many years and will continue to say it: Cincinnati is the baseball capital of the world,” Rose, the major leagues’ career hits leader, told the crowd. The only other Reds player to wear the number since Rose’s 1989 banishment was his son Pete Jr., who was called up in 1997 to spark interest during an 86-loss season. Knicks’ Big Question for Rest of Season: Who Fits the Triangle?